Instead of allergy shots and weekly office visits, you can now get long-term allergy relief simply by putting a few drops under your tongue three times a day. This safe and effective treatment is called sublingual immunotherapy (SLIT) and is available at ACENTA in Fort Smith, AR at the office of Dr. Michael A. Marsh, MD. Allergy drops works similar to allergy shots by delivering a slowly increasing dose of physician-prescribed antigen that helps you build a tolerance to the things you are allergic to. The difference is that the drops are placed under the tongue. The area under the tongue contains dendritic cells which are specially designed to absorb allergens without a reaction. This allows us to treat patients for a much wider range of allergens with less risk of side effects than shots. How Does the Allergy Program Work? We do some detective work to establish what you are allergic to and just how allergic you are to each allergen. How do we do this? We have developed a very safe and painless way to do our discovery work. First, we ask you questions about your symptoms such as when you experience symptoms (day, night, Spring, Summer, Fall, Winter, etc.) and how these symptoms affect you (sneezing, itching, etc.) Second, we give you a stamp test on the inside of each arm. This test takes 30-seconds and is completely painless. And finally, we do a simple blood test and send the sample to a laboratory for sophisticated analysis. •Based on your results from skin testing and blood work, we will find out what you are allergic to and how allergic you are to each allergen. 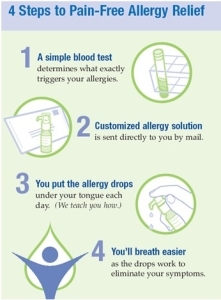 •With this information, we create for you a customized allergy solution that will help decrease your allergy symptoms. •We show you how to self-administer your allergy drops — Just one drop under the tongue, three times each day. •Each dispenser will last for three months. Most patients find their allergy symptoms have significantly improved in their first 3-months of treatment. •Every three months when it is time for a refill on your allergy bottle, we evaluate your progress and gradually increase the strength of allergens in your bottle. •At the end of 3 to 5 years, your immunotherapy will be complete. No more symptoms. No more medicine. No more allergies. Pain-free. Pain-free. Let’s face it; nobody likes shots! Studies have shown that patients on allergy drops are much more likely to stick with the treatment than shots. Once we’ve determined what triggers your allergy symptoms, we customize a solution that helps desensitize you to those allergens. No painful shots are involved. You simply put a few drops under your tongue each day Hassle free. In some of our rural areas, it is simply not practical for patients to visit each week for a traditional allergy shot. With allergy drops, you only visit our office just twice a year. You will come to the office to pick up your first bottle to receive a brief training with your first drop. We mail future treatment bottles to your home address. Symptom-free. Our patients see a significant symptom relief within their first 3 to 6 months of treatment. Over the course of the first year, you should be able to reduce and eliminate the need for antihistamines, steroid sprays or other allergy medications you are using for symptom relief. Our goal is to make you symptom-free for the rest of your life, which takes 3 to 5 years of treatment. Allergy free! If you’re tired of dealing with itchy eyes, sneezing, runny nose, headaches or other allergy symptoms, but you don’t want to go through years of painful allergy shots, call Dr. Michael A. Marsh’s Allergy Clinic at (479) 242-4220 for an appointment. How is sublingual immunotherapy (SLIT) different from over-the-counter remedies? For immediate relief, over-the-counter medications will usually work well at relieving your symptoms. But symptoms will reappear by the next day causing you to take an over-the-counter medication again and again. Unlike over-the-counter remedies that mask allergy symptoms for 12-24 hours, allergy drops (SLIT) work toward a permanent solution by desensitizing your body from your treated allergies for life! The goal of allergy treatment is to eliminate the need for daily over-the-counter medications which may be associated with unpleasant side effects such as drowsiness, difficulty breathing, high blood pressure, excitability or nervousness along with the risk of other drug/food interactions. Allergy drops treat your current symptoms with NO side effects nor do they interfere with any other medications. How do I find out what I am allergic to? During your allergy testing visit, we will draw a blood sample which will be sent to the lab for detailed allergy testing. It may take up to 2 weeks to receive the results from your blood work. We will also perform a skin testing which involves a gentle prick with a drop of allergen extract on your back and arm. This method may result in mild puffiness and reddening of the skin which lets the allergist know which allergens warrant further research. This procedure only takes 5 minutes to perform with results in as quick as 20 minutes. I have never heard of allergy drops, are they new? Allergy drops have been used around the world for over 70 years. Numerous studies validate both its safety and effectiveness. The World Health Organization (WHO) has recommended sublingual immunotherapy as a successful alternative to injection therapy. How complicated is the process and what do I need to do? Joining our allergy program to start living your life allergy free is simple. At ACENTA, our priority is making all your visits a pleasant and comfortable experience. •First, you will begin by meeting Dr. Michael Marsh, who will perform a thorough ear, nose, and throat evaluation to see if the underlying cause of your symptoms is allergies. •Next, you will visit our allergy nurse who will perform a thorough history, get a blood sample, and perform a simple skin test. •Based on your allergy results, Dr. Marsh, and the allergy nurse will work together to create a personalized treatment plan to help you start feeling better. •We will invite you back to our office where you will discover what you are allergic to, learn about your treatment plan and receive your first treatment under our supervision. At ACENTA, we consider you part our family. We will guide you step-by-step and help you begin your path to becoming allergy free. All you need to do is schedule your first appointment with Dr. Michael Marsh by calling our office, and we will take care of the rest! Why do you call yourself a pain-free allergy clinic? Living in this area, we understand how difficult it can be to travel each week to your doctor to receive allergy shots. We find that it doesn’t matter what age you may be, nobody likes shots. We offer sublingual immunotherapy (SLIT), or allergy drops because they are safe, effective and very convenient. This means no shots, no pain, and no weekly office visits – SLIT is a convenient and pain-free way to treat you or your child’s allergies. How old does my child have to be to get tested for allergies? Having your child tested for allergies at an early stage allows you as a parent to be more aware of their environment and/or diet. This, in turn, will help you make modifications and stop the “allergic march” (see question 7 to learn about the allergic march.) Our allergy clinic sees and treats children as young as two years of age. We modify our testing to accommodate these little ones. Will my child grow out of his or her allergies? Research shows that many children with untreated eczema and allergies often develop asthma and other chronic conditions later in life. Therefore, treating them early can have long-life benefits and may prevent the development of other allergies. Can you treat food allergies? One major benefit of sublingual immunotherapy is that a broad range of allergies, including food allergies, can be treated. Almost half of our allergy patients are on treatment for food allergies and are doing great! Other than pure avoidance, sublingual immunotherapy is the ONLY treatment for food allergies. Can you treat patients with asthma? vi. 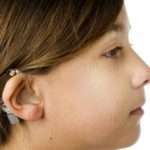 Children with eczema and recurrent ear infections. I have symptoms all year-round, can that be allergies? Many allergens such a mold, dust mites and/or animal dander can be the cause of your year around allergy symptoms. Food allergies can also be a culprit of year-round symptoms. Getting tested for allergies is a excellent idea to find out the real cause of your daily symptoms. How long will it take to become allergy free? Once you start allergy treatment, studies of the immune system show that tolerance can begin within weeks. But permanent changes require three to five years of treatment. Each patient responds to treatment differently depending on the strength and amount of allergen the patient is exposed to. Some patients notice relief in their symptoms within the first few weeks of therapy. Though it may be tempting to stop your treatment as symptoms improve, a permanent solution to your allergies will take several years of treatment. It is important to continue taking drops until your physician recommends discontinuing treatment. Completing the full treatment course of 3-5 years is the only way to ensure you’ve reached a long-term tolerance and possibly have lifetime benefits. How often do I need to come back to the office? Unlike traditional allergy shots that require weekly visits, you will only need to visit our office twice a year to get reevaluated by Dr. Marsh. Our allergy nurse will call you periodically to check how you are doing with your personalized treatment.